Stitch a scene of Spring with this wonderful Marjolein Bastin piece. 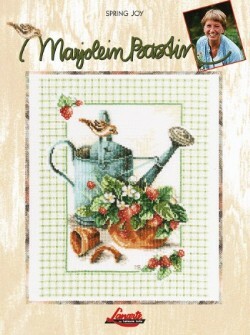 A watering can and bowl of strawberries are surrounded by a checkered border, stitched on Antique White Monaco. This design will bring sunny warmth to any room in your home. Softcover 4-page leaflet.